This article is about the upper part of the human limb. For other uses, see Arm (disambiguation). In human anatomy, the arm is the part of the upper limb between the glenohumeral joint (shoulder joint) and the elbow joint. In common usage, the arm extends to the hand. It can be divided into the upper arm, which extends from the shoulder to the elbow, the forearm which extends from the elbow to the hand, and the hand. Anatomically the shoulder girdle with bones and corresponding muscles is by definition a part of the arm. The Latin term brachium may refer to either the arm as a whole or to the upper arm on its own. The main artery in the arm is the brachial artery. This artery is a continuation of the axillary artery. The point at which the axillary becomes the brachial is distal to the lower border of teres major. The brachial artery gives off an unimportant branch, the deep artery of arm. This branching occurs just below the lower border of teres major. The brachial artery continues to the cubital fossa in the anterior compartment of the arm. It travels in a plane between the biceps and triceps muscles, the same as the median nerve and basilic vein. It is accompanied by venae comitantes (accompanying veins). It gives branches to the muscles of the anterior compartment. The artery is in between the median nerve and the tendon of the biceps muscle in the cubital fossa. It then continues into the forearm. The deep artery of the arm travels through the lower triangular space with the radial nerve. From here onwards it has an intimate relationship with the radial nerve. They are both found deep to the triceps muscle and are located on the spiral groove of the humerus. Therefore, fracture of the bone may not only lead to lesion of the radial nerve, but also haematoma of the internal structures of the arm. The artery then continues on to anastamose with the recurrent radial branch of the brachial artery, providing a diffuse blood supply for the elbow joint. The veins of the arm carry blood from the extremities of the limb, as well as drain the arm itself. The two main veins are the basilic and the cephalic veins. There is a connecting vein between the two, the median cubital vein, which passes through the cubital fossa and is clinically important for venepuncture (withdrawing blood). The basilic vein travels on the medial side of the arm and terminates at the level of the seventh rib. The cephalic vein travels on the lateral side of the arm and terminates as the axillary vein. It passes through the deltopectoral triangle, a space between the deltoid and the pectoralis major muscles. In Hindu, Buddhist and Egyptian iconography the symbol of the arm is used to illustrate the power of the sovereign. In Hindu tradition gods are depicted with several arms which carry specific symbols of their powers. It is believed that several arms depict omnipotence of gods. In West Africa, the Bambara use forearm to symbolize the spirit, which is a link between God and man. Symbolic gestures of raising both hands signal surrender, appeals for mercy, and justice. The cubital fossa is clinically important for venepuncture and for blood pressure measurement. When the arm is fractured this may refer to a fracture of the humerus bone. Veins on the arm may be taken when a coronary artery bypass graft is needed. In other animals, the term arm can also be used for analogous structures, (such as one of the paired forelimbs of a four-legged animal or the arms of cephalopods). 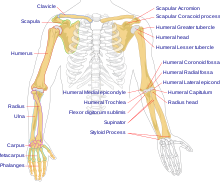 In anatomical usage, the term arm may sometimes refer specifically to the segment between the shoulder and the elbow, while the segment between the elbow and wrist is the forearm. However, in common, literary, and historical usage, arm refers to the entire upper limb from shoulder to wrist. This article uses the former definition; see upper limb for the wider definition. In primates the arm is adapted for precise positioning of the hand and thus assist in the hand's manipulative tasks. The ball and socket shoulder joint allows for movement of the arms in a wide circular plane, while the structure of the two forearm bones which can rotate around each other allows for additional range of motion at that level. Gross anatomy of the upper arm and elbow. Wikimedia Commons has media related to Arm. Look up arm in Wiktionary, the free dictionary. ^ a b "brachium – free dictionary". Retrieved December 2, 2013. ^ "Dictionary.com". Retrieved December 2, 2013. ^ Tresidder, Jack (1997). The Hutchinson Dictionary of Symbols. London: Helicon. p. 16. ISBN 1-85986-059-1.